Summer desserts have to be easy, fun, and minimal on oven time. I want a flavor that reminds me of my childhood, bright, complex, lemony, and sweet. I also bought my first ever bundt pan, so I want to make something in that, because I didn’t spend $8 for nothin’! I took a simple cake recipe and added a bit of lemon flavors, creaminess, and berries to make the plain extraordinary, and then coated it in a glaze because why not? Preheat your oven to 350 and grease the crap outta your bundt pan. In a large bowl whisk the flour, baking soda, baking powder, and salt together. Set aside. Blend the eggs, oil, butter, sugar, lemon curd, lemon juice and zest until smooth. The lemon may make the butter look almost as if it’s curdled; don’t worry about it. Using a spatula combine the wet mixture into the flour mixture. The batter will seem thicker than your average cake batter. In yet another bowl, mix together the Greek yogurt, honey, and sour cream. Fold or cut the cream mixture into the cake mix. Pour 1/2 of the the pureed berries into the batter and mix slightly. Pour the second half into the batter, but don’t mix, let it hang out all messy like. Pour/dollop the batter into the bundt pan and cook on the middle rack of your preheated over for 40-45 minutes or until a toothpick comes out clean. Let the cake cool at least 20 minutes before inverting it and removing from the bundt pan. Let the cake cool at least another 30 minutes before pouring the glaze over the cake and letting the excess drip over the sides. You can also poke small toothpick holes all over the cake before topping with glaze to really allow the sweetness to penetrate the freshly baked goodness. One of my favorite things about this is that it’s flavorful without being very sweet, so a slice in the morning is a great alternative to coffee cake or some other stale pastry. Want a simpler version? 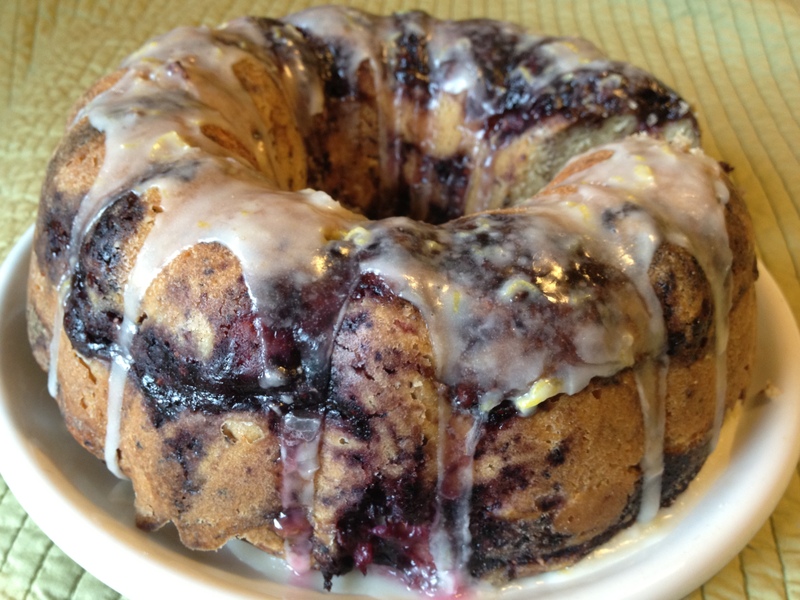 Get a boxed lemon cake mix, prepare the batter according to the directions with the addition of the juice of a lemon, mix in the sour cream concoction noted above, pour in the berries just as I mentioned previously, and bake in a bundt pan according to the box. It’s a faster, less involved way to meet the same ends. 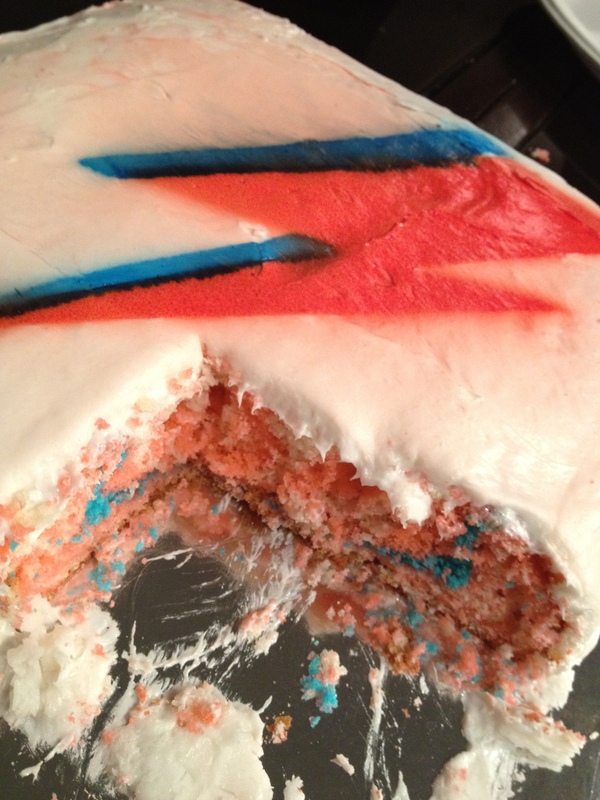 And in the spirit of cakes, a friend made a sheet cake of psychedelic colors, and an airbrushing of Aladdin Sane, in honor of the 40th anniversary of The Rise and Fall of Ziggy Stardust and the Spiders from Mars. It was delicious and absolutely worth sharing here. 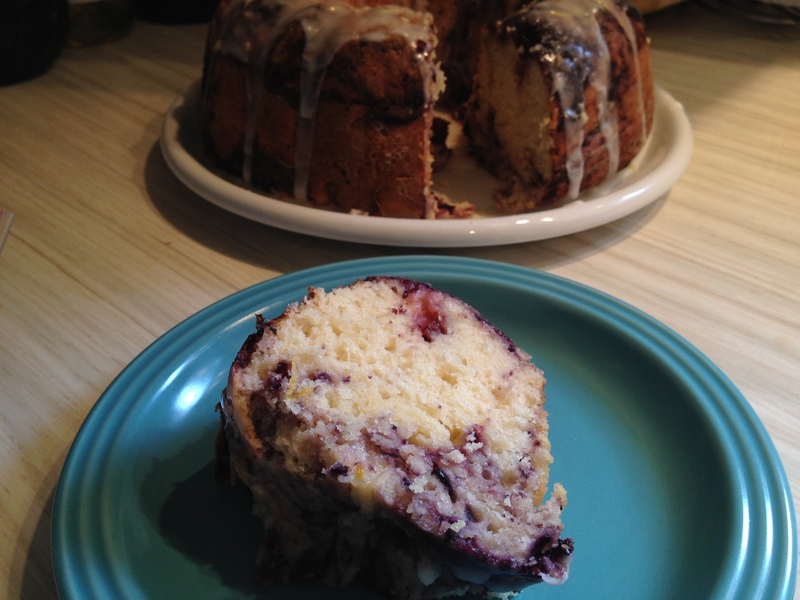 This entry was posted in Comedy, Entertainment, Food, Humor, Pop Culture, Recipes and tagged air brush, berries, blue berry, bundt, bundt cake, DAVID BOWIE, dessert, dinner party, easy, eat, fast, food, foodie, fun, lemon, recipe, recipes, simple, summer.